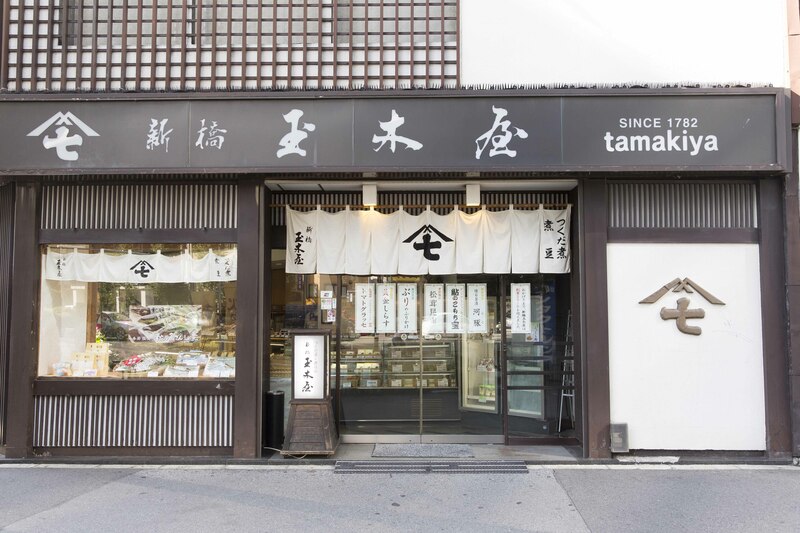 Thayne-san, today we’re going to visit an old tsukudani shop, “Shinbashi Tamakiya.” It was established in 1782 when Shichibei from Tamaki in Echigo Province (now Niigata Prefecture) came to Edo, and began a shop that sold boiled beans. This is the crossing between Sotobori Street and Ginza Street. It’s a good location with a lot of foot traffic. Tamaki:Welcome. I’m Shoko Tamaki from Tamakiya. Hello.There are a lot of tsukudani in your display window, but I hear you started as a boiled bean shop. Tamaki: That’s right. 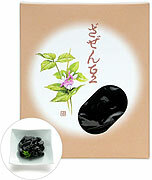 Even now, zazen beans, a simple kind of boiled beans made with flat black beans boiled in soy sauce, are one of our specialties. They were often eaten in the founder’s hometown, and after the flavor was adjusted a little, it seems they were well-liked in this area too.This photo is from the Meiji Era, but there was a big line in front of the shop at the end of the year, and you can see the construction workers trying to organize the traffic. After that, you began to make tsukudani too, and prospered even more. Tamaki: Yes, it was the third generation owner who first made tsukudani. And you’ve kept the flavor the same all this time. Tamaki: Actually, no. It’s a bit of a long story. Do you want to hear it? Tamaki: The truth is, I wasn’t born and raised in this business, I married into it. Then, one day after being married seven years, my grandfather-in-law suddenly said, “Take over the shop for me,” and he left it all to me.My children were still small, so I was very busy with child rearing, and I didn’t even have any experience doing business. Furthermore, when I began, there were a lot of employees who had been working there for a long time including the head clerk, and many of them were relatives, so…. Tamaki: Yes, it still is (laughs). But sob-stories aside, in the last 40 years, I’ve changed the shop little by little.First, I changed the flavor. Tamakiya had been famous until then for the saltiness of its tsukudani. We do have customers who like salty tsukudani, and that was a characteristic and selling point of Tamakiya. But one day one of my children ate the tsukudani and shuddered because it was so salty. When I saw that, I decided to change it.After that, I made the flavor lighter little by little. I change it so slowly that even the regular customers don’t notice. It took decades. Tamaki: And then I wanted us to become a shop that sells the “real thing,” so I decided not to use preservatives or sweeteners.In the past we actually used to buy some of our tsukudani, but I stopped that and decided to make it all ourselves. We built a factory, and decreased our suppliers. Some of the businesses we dealt with were small businesses that said they would go out of business if we stopped working with them, so we slowly decreased our orders while discussing it with them. Because of that, it took ten years for all our products to be made in-house. But, in any case, I didn’t want to lie to our customers and tell them the product was ours when it wasn’t. 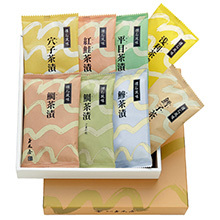 Tamaki: But even after we changed the flavor, when selling our products in department stores and on shopping streets, for example, we often hear people say, “Tamakiya is too salty, so we don’t want it.” It’s not salty anymore, but they don’t believe us. That’s how strong our past reputation is. It’s not just a matter of refining the taste, you still need to work hard on getting people to believe it has changed. Tamaki: Yes. And so, we changed the packaging too. 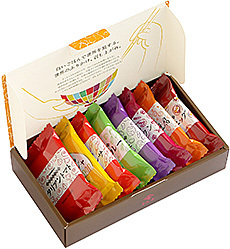 My predecessors were just putting their valuable products in basic packaging, so I changed it all so that it would be a package that you would be happy to get and could give as a gift. Anyway, it took years, but we’ve changed everything. There are a lot of tsukudani in the showcase. Which do you recommend? Tamaki: Try the sugatani first. There’s saury fish boiled with Japanese pepper, trout (komochidakara), and mackerel sugatani. Each of them are boiled until even the bones are soft, so you can eat them whole.After that, there’s of course the standard tsukudani. Short-necked clams, kelp, cod roe, scallops, clams… all of them are cooked so tender and delicious.It’s a little different, but we have fig glace. It won the Monde Selection Gold Award several times, and it’s a rare dish that we pride ourselves in. The number of young fans we have has increased because of this. Tamaki: And what we’re working on now is World Furikake and Kaiseki Chazuke. World Furikake is something that you can sprinkle on rice, but by sprinkling it on pasta and salads, you can enjoy all kinds of flavors from around the world. Italian tomato, tom yum kung, maharaja curry, hot salsa, Sichuan mabodofu … What an amazing line-up! This is new! Tamaki: Kaiseki Chazuke is something that we developed so that people can enjoy restaurant-quality flavors at home, but it’s also gets great reviews as a souvenir to take overseas. You are certainly full of ideas! （田巻） いまは、私だけじゃなくて、娘たちも一緒に考えてくれています。紹介します。長女の麻衣子と次女の恭子です。Tamaki: It’s not just me now. My daughters also think of ideas with me. I’ll introduce them. This is my elder daughter, Maiko, and my younger daughter Kyoko. They’re gorgeous! The shop is thriving with you three ladies running it. Maiko: Our company motto is “We deliver delicious food,” and in the future we want to be relied on to deliver delicious and original food. I’m sure a lot of people really do rely on you. How do you see the lifestyle of your mother as her daughter and successor? 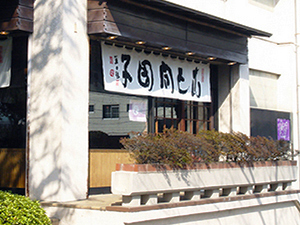 Kyoko: Mother is the 9th generation owner of Tamakiya, but she changed everything, and I feel like a new shop has been created now. I want to inherit her courage and ability to act. Wonderful!Thank you for letting us visit today. Copyright © 2001 - 2019 Toto norankai. All Rights Reserved.